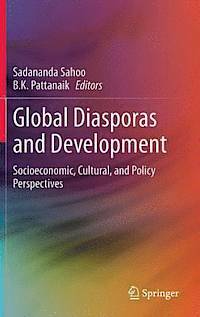 Global Diasporas and Development: Socio-Economic, Cultural, and Policy Perspectives, Edited by Sadananda Sahoo and B.K. Pattanaik. ISBN 978-81-322-1046-7, Springer India, 2014. The concept ‘Diaspora’ has undergone metamorphisms ever since it has been derived from the Greek word ‘diaspeiro’. Diasporas have always been perceived as ‘paradigmatic of nation state’ because of their persisting ethnic and cultural orientations with homeland. Given their ‘dual identity’, they are considered as an ‘inevitable link’ between homeland and host land. The advent of globalization and advancement of communication and transport technologies coupled with structural changes in the global economy have resulted in the intensification of linkages and crystallization of their due role in host and homelands. Having realized their potential, many countries around the world, have unleashed pro-active Diaspora policies to leverage upon their expertise and wealth. Subsequently, the growing role of Diasporas in various economic activities of homelands has a deepening macro and micro economic consequence. Scholars around the world have become very inquisitive about this phenomenon. Many conferences and seminars have been organized around this theme. This book is the outcome of the international conference “Diaspora and Development: Prospects and Implications for Nation State”. The book has twenty three articles of various scholars drawn from varied disciplines from different parts of the globe. The editors of this volume discuss in the ‘Introduction’ (chapter one) the conceptual issues of the terms ‘Diaspora and development’ and the imperativeness of Diasporas for development under the aegis of globalization. Finally, they have ended their introductory remarks by providing snapshots of all the included articles. Migration is no longer perceived as a disadvantage as migrants are now seen as agents of development for home countries. Migrants contribute in myriad ways to the betterment of their countries of origin. A total of six categories of impact are identified (chapter two). Diaspora can serve as donors, investors, knowledge networks, brain gain, markets, and ambassadors. Recognizing these spheres of influence, governments are beginning to build Diaspora strategies, policies, schemes, and programs to capture, enhance, and ramp up positive contributions in each case (chapter two). Diaspora- centered development strategies are most commonly pursued by poor and middle-income countries from the global south. Even the global north is also showing interest given large presence of their overseas communities across the globe. With the help of effective Diaspora strategies, nation states are competing against each other to leverage the potentials of Diaspora. It is very important to note that the location of Diaspora in the host land determines the level of engagement with origin countries. Further, the contribution of Diaspora to their origin countries also depends upon the host country’s environment and there should be institutional arrangements, structural changes, policy reviews and bilateral agreements with the host countries for effective Diaspora engagement (chapter three). The implementation of Diaspora strategies by various countries have thrown up debates over the concept of citizenship. Countries around the world are wrestling with the problem of formulating progressive and yet secure, operational, and defensible dual citizenship policies for legally defined meaningful engagement with its Diasporas (chapter two). Though Diaspora strategies have yielded desired results in the origin countries, they are also being critiqued for gaps, misplaced priorities and promotion of inequality (chapter two). Given the huge remittance sent by the emigrants to the country of origin, there have been many savings, social security benefits, pension schemes have been introduced. When they return, it would offer benefits especially to vulnerable unskilled labourers(chapter twenty one). To woo back their diasporas, the global south has constantly been reviewing its Diaspora strategies in favour of migrants in making them partners for the growth and development of the region. In the wake of internalization of the economy, Diasporas are playing a pivotal role given their multiple locations and transnational linkages. They are considered as a ‘development tool’ or ‘stakeholder’ in the economy of home and host lands. Under the phenomenon of globalization, there has been an exponential growth of international migration from global south to global north for unskilled and high skilled labourers. On one hand, the receiving countries have been chalking out favourable migration policies to attract them. On the other hand, the sending countries are luring the emigrants with effective Diaspora strategies for the growth and development of the country given the economic potentials of the emigrants. Diaspora finance - in the form of remittance, investment and philanthropy-technology transfer, and entrepreneurship have promoted the economic growth and development in the origin countries. The economic impact of Diaspora can be seen at macro and micro levels in the origin countries. The sending of remittance to origin countries by the migrants has reduced constraints on balance of payment. Remittance as monetary transfers includes personal deposits, investments, intra family transfers, donations to relatives or other projects in their country of origin, pension and social security transfers. The impact of remittance is manifold. It enhances human and physical capital accumulation in the country of origin. The effective utilization of remittance for human and physical development requires good institution in the origin countries. There is a correlation between both (chapter five). In addition to remittance, financial instruments like Diaspora bonds are floated to attract the investment of Diasporas. Diaspora bonds offer Caribbean governments and corporations an innovative financing mechanism that targets the previously untapped Caribbean Diaspora community to obtain a more stable and less costly source of external finance (chapter six). The economic benefits are pervasive all over the country of origin due to engagement with Diaspora. The economic impact of Diaspora varies from region to region within the country, given the variety of migration routes, histories and practices of various migrants. So, what is needed is more context-specific analysis for assessing the divergent development (chapter four). Owing to globalization, and technological innovation, and emergence of knowledge based economies, there has been a huge demand for skilled migrants from global south to global north. In the absence of viable opportunities in the country of origin, many highly skilled migrants had embarked upon migration to the global north, given favourable migration policies and lucrative opportunities over there. The loss of highly skilled migrants was earlier viewed as ‘brain drain’ by sending countries. The causes, costs and consequences of brain drain have been manifold (chapter seven). In the recent decades, there has been a reverse trend which is popularly termed as ‘brain circulation’ or ‘brain gain’ given the economic structural changes, globalization processes and advancement of communication technology across the globe. In addition to a huge quantum of remittance, they have engaged in knowledge and skill transfers to their countries of origin (chapters eight, nine and eleven). In the twenty-first century, there has been reverse migration from global north to global south which can be attributed to rapid as well as sustained economic growth and prowess of global south. Further, many developing countries have engaged in ‘brain gain’ strategy to attract its human capital by setting up ‘Edu Cities’ which are knowledge based hubs with amenities of world standing(chapter eleven). Moreover, the rapid economic growth of the global south has facilitated the return of its migrants. Even the laws have been enacted to encourage integration and adaptation with their country of origin after their return (chapter eighteen).Leaving brain drain and brain gain discourse aside, the growing demand for international education has facilitated huge student populations from global south to global north. They have engaged in creation of knowledge society in their origin countries formally and informally. The expansion of knowledge Diasporas creates new transnational networks that promote scientific, social and economic development (chapter ten). The highly skilled Diasporas not only transfer business and scientific knowledge, but also transfer cultural and social knowledge which is termed as ‘soft knowledge’ for development of their origin countries (chapter twelve). Diaspora network entails an easy transfer of skills and resources to the development of origin countries (chapter thirteen). Thus, with the help of effective Diaspora strategy, the engagement of Diaspora can be expanded for assisting the growth and development of country of origin. Diasporas are not only productive, they are counter-productive as well. Owing to ethno-religious nationalism, they may pose a security threat to nation states and retard national and regional developments. Further, owing to geopolitical compulsions coupled with ethno-political uncertainty and vulnerability, some Diasporas constitute agents of insecurity for some nation states. One such instance is the role of Diasporic Banyarwanda in post -1959 Rwanda’s and Africa’s Great Lakes Region (GLR)’s insecurities (chapter seventeen). The large exodus of population in a very short span of time due to political unrest will lead to underdevelopment for a country and cultural disintegration at the individual level. For instance, a gargantuan out migration of highly skilled Zimbabwe migrants due to political violence, has resulted in glaring negative effects on all sectors of the nation (chapter fifteen). The dominance of communal Diasporic forces has overlooked other potential sources of investment for realizing developmental objectives of a country which resulted in the contested development in Mauritius (chapter nineteen). Hence, the developmental role of Diasporas is both positve and negative in a nation state. Apart from economic and political implications, Diasporas play an instrumental role for cultural development of a homeland and host land. The retention of language and various cultural practices have resulted in the creation of a homeland cultural milieu in the host land. The ‘hybrid’ cultural experiences of Diasporic communities have added new dimensions to the cultural fabric of homeland. The emergence of Kali Theatre Company in UK provided a platform for South Asian women to adopt their cultural pursuits in a multicultural context (chapter twenty two). The Diasporic literatures have contributed immensely for the development of a new genre of literature to the literary tradition of homeland. For instance, Amitav Ghosh has written a trilogy called ‘sea of poppies’ which traces the journey of Indian indentured migrants who are popularly known as ‘girmitiyas’. By studying that, one can understand socio-cultural process, cultural artefacts and homeland orientation of Diasporic communities (chapter twenty three). It is often the cultural and emotional linkages that provide ground for economic and political engagement of the diaspora with home land and vice versa. In the light of liberalization, and globalization accompanied by scientific innovation, Diasporas have emerged as major ‘economic actors’ in home and host lands. This book demonstrates the linkages between migration and development and subsequent implications on a nation state clearly. The contents of the book has enriched the concepts ‘Diaspora and development’. The book is voluminous, containing twenty three essays drawn from a large corpus of empirical data being pulled out from different parts of the globe. Though the book delves upon the Diaspora engagement of Indian experience more, it has discussion about various regions of Asia and Africa regions, thus provides a comparative perspective. It has a wide range of illustrations- diagrams, tables, pie charts and bar diagrams to substantiate the arguments. The book is fraught with examples, case studies and ethnographic accounts in defense of main arguments. It has an array of methodological approaches. The highlight of the book is that it has shown Diaspora engagement and migrant experience from the countries like New Zealand, Australia, and Netherlands, Asian and African regions rather than already well focused countries like U.S.A, Canada and UK. As the book is the outcome of the international conference, the editors have tempted to include some essays which are not related to the focus theme. For instance, chapter fourteen sheds light on the intricacies of European identity of Muslim Diaspora and discusses the politics of exclusion and inclusion. Likewise, chapter sixteen throws light on the integration and ‘limited acculturation’ process of Tibetan Diaspora in Shimla. Yet another chapter (twenty) discusses about transnational marriage and shifting gender roles among immigrant women in Taiwan. The book has subscriptions more than prescriptions for deepening the Diaspora engagement ahead. Barring, the slip of a typological error (Page 12), the language as well as prose style is very lucid and legible to read and comprehend well. Overall, the book is an ‘omnibus’ reader on Diaspora and development discourse. It is very useful reference material for researchers, policy makers and academicians in the domain of Diaspora and development.